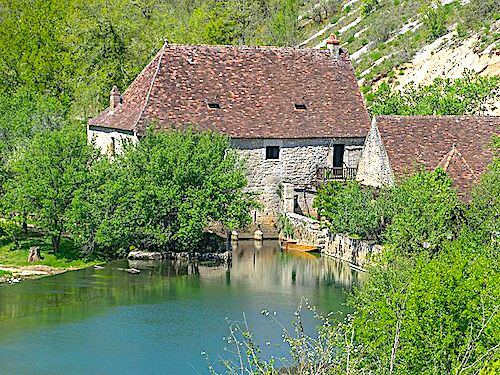 The Moulin de Cougnaguet’s superb architecture, long history and spectacular setting turn it into a key tourist site of Quercy. 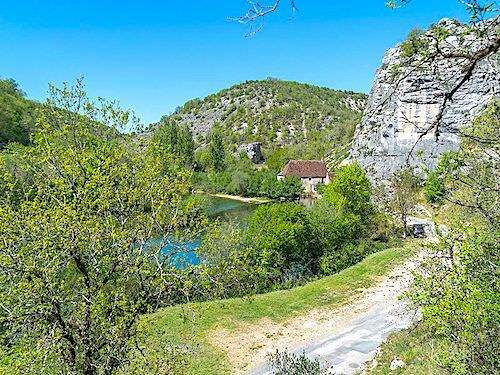 The monks of the Cistercian Abbey of Les Alix, near Rocamadour, built it between 1292 and 1350 on a ford of the river Ouysse. Visitors marvel today at its spectacular setting, but centuries ago it was at a distance from the main road and an easy prey for flour looters. In the Middle Ages, bread was indeed rural populations’ staple food, and flour was quite sought after. The monks therefore fortified three of the mill-room facades, as well as the south facade of the watermill, which they opened with loopholes. They also built a 6m thick dam and installed a system of valves operated by a wooden winch to submerge the ford, and thus the access to the mill, in case of attack. The watermill was a working site; the mill-room was very rustic and paved with pebbles, as were most rural buildings then. 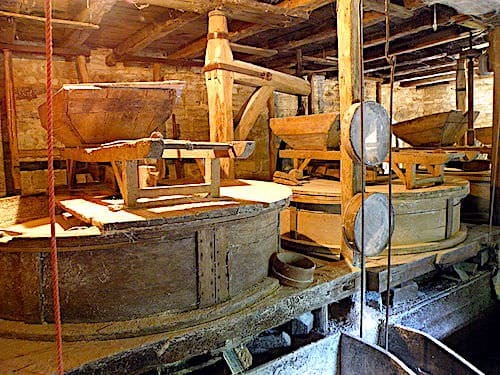 Four pairs of 1.5-ton grindstones driven by wooden spinning wheels crushed the grain and produced 3 tons of flour per day. The mill’s outdoor and interior mechanisms are still in perfect working order, as they were continuously maintained for generations. Not only did the watermill function until 1959, but it was also listed as a Historical Monument in 1925. The monks sold it in 1778. The mill is still a private property, but is open to visits from April to September; an ideal opportunity to attend a flour making demonstration and admire the mill’s impressive mechanisms.